FILE - Men ride a motorbike past a hazard sign at a site hit by an airstrike on Tuesday in the town of Khan Sheikhoun in rebel-held Idlib, Syria, April 5, 2017. The hazard sign reads, "Danger, unexploded ammunition." Russia clashed with Western nations Tuesday over a report blaming Syria for a deadly chemical weapons attack, with Moscow dismissing its findings as "mythical or invented" and the U.S. backing its finger-pointing at President Bashar al-Assad's regime. The debate in the Security Council during a meeting on the report reflected the sharp differences between Russia, Syria's most important ally, and Western countries that have backed Assad's opponents. It also raised serious questions about whether the mandate of the experts who issued the report will be renewed — and whether anyone in Syria will ever be held accountable for using chemical weapons, which are banned internationally. Russia and the United States have circulated rival resolutions to extend the experts' body, known as the Joint Investigative Mechanism, or JIM. Its mandate expires Nov. 14. FILE - United Nations Ambassador from U.S. Nikki Haley address U.N. Security Council meeting at U.N. headquarters, Sept. 28, 2017. U.S. 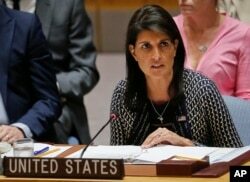 Ambassador Nikki Haley told the Security Council that a revised U.S. draft circulated Tuesday included some points from the Russian draft, including the importance of high standards and sound evidence. But she said Russia continues "to push unacceptable language only meant to undermine the investigators and divide this council." Russia vetoed a U.S.-sponsored council resolution Oct. 24 that would have renewed the mandate of the experts from the United Nations and the international chemical weapons watchdog for a year. It said it wanted to wait to see the JIM report on the sarin nerve gas attack on the town of Khan Sheikhoun and a mustard gas attack at Um Hosh in Aleppo in September 2016. Two days later, the JIM reported its leaders were "confident" that Syria was responsible for an aerial attack on Khan Sheikhoun on April 4 using sarin that killed about 100 people and affected about 200 others who survived "acute exposure" to the nerve agent. The conclusion supported the initial findings by the United States, France and Britain. The experts also said they were "confident" the Islamic State extremist group was responsible for the Um Hosh attack using mustard gas. Assistant Secretary-General Edmond Mulet, who heads the JIM, told the council how experts reached their conclusions, including finding that the chemistry of the sarin used in Khan Sheikhoun was very likely to have been made from the same precursor, called DF, as the sarin in Syria's original stockpile. FILE - A still image taken from a video posted to a social media website on April 4, 2017, shows people lying on the ground, said to be in the town of Khan Sheikhoun, after what rescue workers described as a suspected gas attack in rebel-held Idlib, Syria. In September 2013, Syria accepted a Russian proposal to relinquish its chemical weapons stockpile and join the Chemical Weapons Convention. That averted a U.S. military strike in response to an alleged chemical weapons attack that killed hundreds in the Damascus suburb of Ghouta. Mulet said the Security Council has "a unique responsibility" to deter all those using chemical weapons and "end the use of such weapons forever." "I understand the political issues surrounding the situation in the Syrian Arab Republic," he said. "However, this is not a political issue about the lives of innocent civilians. Impunity must not prevail." Russia's deputy U.N. ambassador, Vladimir Safronkov, was sharply critical of the JIM and the report, especially the experts' failure to visit Khan Sheikhoun, which Mulet said was for security reasons. Safronkov derided the JIM for not pinpointing specific responsibility, asking: Is "an entire state is responsible?" He also complained that "while some continue to try to find this mythical or invented chemical weapons in Damascus, the region is seeing an increasing threat of chemical terrorism" that isn't being addressed. Deputy British Ambassador Jonathan Allen said Russia has advanced multiple theories about the Khan Sheikhoun attack, and when one gets debunked Moscow goes with something else. "It's one of the great tragedies that Russia is a country with hugely respected and impressive scientists, but also a country of great fiction writers," he told several reporters. "And unfortunately the scientists of Russia are being ignored and the fiction writers are being indulged." Allen called Russia's draft resolution to renew the JIM mandate "a cynical ploy to discredit a professional, independent and impartial body." "Russia is trying to shoot the messenger to cover up for the crimes of the Syrian regime," he said. Syria's U.N. ambassador, Bashar Ja'afari, the last speaker, told the council the JIM report "is not neutral, nor is it professional." Its "wrongful" accusation against Syria is based on "the fabrication of evidence and the manipulation of information," he said. Ja'afari said Syria abides by the Chemical Weapons Convention and "considers the use of chemical weapons an immoral act that must be condemned."